A Consolatory Discourse, Perswading to a Chearfull Trust in God in these Times of Trouble and Danger. By Symon Patrick Rector of St. Paul Covent Garden. A Consolatory Discourse. Things now so calamitous. THe face of things is now so calamitous, and there is so much sadness discovers it self in the looks of all those who are serious and affected with our present miseries, that it seems as great a deed of charity to send some comfort to them, as to call the careless world to Repentance. There hath not a week of late passed, but we are told in the Bils of Mortality, that some are dead of Grief. The weight of many mens sorrows is so great, that it sinks them to their Graves. And they that are not yet so heavily oppressed, yet groan under their burdens ; and we hear every day of some or other that are ready to faint by reason of the anguish of their spirits. We have some hopes indeed that the number is not very great who are so sorely distressed ; but yet there is a General damp I observe upon the better sort of souls ; and there are many things concur to cast a cloud over their faces. Some are very heavy for the loss of their friends, and others for the fear of that loss. It afflicts some to see such a decay of Trade, and others begin to have apprehensions of Poverty, and think it is possible they may fall into Want. We see men startled very much to find the Burials swell’d to such an height the Week that is passed ; and again it affrights them to think of the summe that this Week current may mount them unto. Most men are possessed with a fear of Death, which now surrounds them on all sides; and others that have been free from those terrors, yet are in some dread of that kind of Death that domineers among us. In so much that they are very numerous, methinks, whose very aspects beg for some consolation. We can cast our eyes no where but we behold some or other imploring our help ; and craving something that may brighten their countenances, by reviving and cheering their drooping spirits. 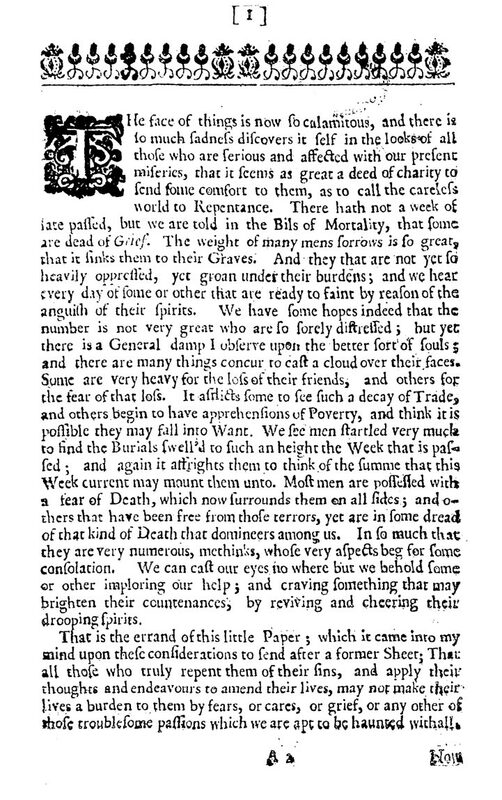 That is the errand of this little Paper ; which it came into my mind upon these considerations to send after a former Sheet ; That all those who truly repent them of their sins, and apply their thoughts and endeavours to amend their lives, may not make their lives a burden to them by fears, or cares, or grief, or any other of those troublesome passions which we are apt to be haunted withall. Now though there be many particular supports which are easie to be produced for mens relief, under every one of those evils which are the cause of their complaints ? yet this discourse being confined to so small a compass as a Sheet, it will be best to direct you to one remedy for all Diseases. Especially considering that one Medicine will be better remembred then a great many ; that the application and use of it also will be more easie ; and that the mind being fixed in one point, it will be the less subject to distraction by a multitude of thoughts. And when I cast mine eye upon the Holy Books to find that which may be most proper for every mans case ; I can see nothing so much spoken of, nothing so much magnified and applauded for a present Cure of all troubles, as Trusting in God. Our Fathers trusted in thee ( saith the Prophet in that mournfull Psalm 22. 4, 5. ) they trusted and thou didst deliver them. They cried unto thee and were delivered : they trusted in thee and were not confounded. Here you have the practise and Experience of Ancient times, which are a direction to us in like cases. You have here so approved a Remedy, and which this Divine Writer thought so safe, that he resolved to take no other course in a time of such Contagion as this is. For having observed that he who flies to the Most High as his Sanctuary, abides under the shadow of the Almighty, he determines to seek for no other comfort or security, but thus concludes with himself ; I will say of the Lord, He is my refuge, and my fortress ; my God, in him I will trust, Psal. 91. 1, 2. A Consolatory Discourse. The cure for our troubles. Let us see then of what this famous and so much tried Remedy may consist. Let us search of what an Antidote so powerfull is compounded. If it be such an Universal Medicine, it concerns us very much to be well acquainted with it ; that we may not mistake in the making of it, either by leaving out or putting in of any thing which may spoyle its efficacy. And to say the truth it is a very plain and simple thing which will not torture your wits to comprehend. This is the beginning of your comfort, that there is nothing in it but what is vulgarly known, if it were but as well followed and put in use. It is only to behave our selves towards God as we do to one of our Good Neighbours, of whose skill and fidelity we have assurance, and the business is done. I. First then if an honest man give us his word for the performance of any thing we desire of him ; on this we rely as our security, demanding no other ; from whence we are said to trust that person. Which directs us if we will place our confidence in God, to be throughly perswaded of the truth of all that he hath promised, resting assured that it shall certainly be fulfilled. Is there nothing that God hath given us his word for ? Doth he not stand at all ingaged to us ? Can we find nothing upon record that he hath said for our comfort and support in this world of sorrows ? Turn over the leaves of that Book which is deservedly called the Book of God, and you will see that he hath tied himself unto us for the performance of several things that highly import us, not only by his word but by his Oath. He hath testified his singular care of the happiness of the world. He hath shewn the great desire he hath that his creatures should live in good comfort, and not be miserable, in that he hath not only said but sworn that he will do them good. He hath assured us in a more solemn manner then could be desired, that he will provide for us ; that he will give us a competency of these worldly goods; that he will never leave us nor forsake us ; that he will be our support and comforter in all afflictions ; that he will strengthen us on a bed of languishing, and make all our bed in our sickness ; that he will lay no more upon us then we shall be able to bear ; and that all things shall work together for good to those that love him. Of which promises you must no more doubt then if it were in your own power to bestow these blessings on your selves. And is all this nothing think you to cheer a mans heart ? Is there no vertue in these words ( if stedfastly believed ) to raise up your sinking spirits ? Will it give you no joy to think that you are so sure to be under the care of God ? You would have had him promised you perhaps that you shall never be sick : or that you shall not be sick of any contagious disease ; or that you shall have long life ; or come to great riches and honours, without which you cannot be content. Poor Fools ! He hath promised you far nobler enjoyments, and would not have you set your hearts on things of so low concernment. Besides those that I have mentioned, there are three most remarkable things which he hath passed his word and faith for, which if you believe, I shall soon give you satisfaction in the lesser matters of which you are so desirous. First, he hath promised forgiveness of sins if you heartily amend. An inestimable favour ; and which imports us more then to be well, to be rich or to enjoy all the pleasures on earth. For they are in truth no pleasures, whensoever a man thinks of Damnation at the last. Secondly, he hath promised the gift of the Holy Ghost to help and sustein us ; to comfort and cheer us ; to guide and conduct us in our way to the third thing that he hath assured us of. And that is Eternal life to reward our Piety, our fidelity, our Patience and Adherence to him. This St. John hath set a mark upon as the most illustrious of all other, saying, This is the promise that he hath promised us even eternal life. 1 Epist. 2. 25. As if he would have us fix our eyes on this above all other things ; and have us to think that if God hath not said so much concerning temporal enjoyments as we desire, the reason is because his word is a thing which it is fit his Majesty should pass in matters of more moment, and of which there might be greater doubt. And truly these things which I have named are such that if we can believe them upon his word, we may well trust him for all the rest without his word. For who can think that he who will give us heaven, will deny us any thing that is fit for us upon the earth ? or who can be such an Idiot as to imagine that he who is so liberal as to bestow eternal life, will be sparing of a long life to us here if he judg it most convenient? II. To direct you to place a confidence in God that he will give you whatsoever is best for you though it be not promised. It is a great imperfection and robs men of much comfort, not to be able to rely on God unless they have his word for every thing. Is not the Nature of God think you as great a security to us as that can be ? Truly they that understand things, judg it to be rather greater; because it is that which gives credit to his word. Why do you believe, I beseech you, what God saith ? Is it not because you know his Truth and Goodness to be so unspotted that he cannot possibly deceive you ? Let us then be of good cheer. From hence we may derive our comfort as well as from any thing else. Nay this is the very Original and fountain of all our consolation and support, that God is of such a Nature that he delights in the welfare and contentment of his Creatures. From this we may fetch as much joy as we please. We need not doubt to conclude from hence that we shall have all that is good for us though there were not one word said of it. And he is neither good nor wise that will desire more, and not rest himself contented in this perswasion. Let us have recourse if you please to our dealings one with another ; for by them I told you we should best understand what it is to trust in God. Do we never repose a confidence in an excellent person unless he give us his word or his bond ? Are there not some men of whom we have such an high opinion that we readily deposite our money, our jewels, our Deeds or any thing else in their hands, and never so much as ask them to give us their promise that they will safely keep them for us ? Why do we think it strange then to depend on God in this manner ? Why do we not think that we have assurance enough from the absolute perfection of Gods Nature that it shall go well with us ? what is the matter that we cannot be satisfied without he pass his word ; and that we are not confident in himself that we shall want no good thing ? In my poor judgment this is rather to trust in God then the Other. I mean he is more properly said to trust in God who perswades himself that he is so good as to give him all things needfull, though not particularly promised ; then he that relies only on his word. For this latter is rather to be called Faith then Trust. Between which two there seems to be this difference, that faith hath respect only to the word of God ; to what he saith and expresses : but Trust goes further and hath respect also to God himself. It looks not only at what he is ingaged to do ; but at what he is inclined to do for us. Conclude therefore with the Psalmist and pronounce it in a joyfull and triumphant manner ( 84. 11, 12, ) The Lord God is a Sun and shield : the Lord will give grace and glory ; and no good thing will he withhold from them that walk uprightly. O Lord God of hosts, blessed is the man that trusteth in thee. He doth not envy any of his blessings to us. He is as free of his favours as the Sun is of his beams. He is no more backward and unwilling to do us any good, then that great Lamp of heaven ( which is as it were his Visible Image ) is to impart its light and heat to the world. And therefore he is in a blessed Condition that trusts in God. He hath united himself by that means to the very fountain and source of all good things ; and so cannot fail to enjoy in every condition that which is most profitable for him. Be it health, be it riches, be it long life, which we think is best for us ; if God think so too, we may resolve his bounty will not let us want it but certainly bestow it upon us. III. You must in this confidence commit your selves to his good providence that he may dispose of you as he pleases. If you verily believe that God will have a care of you, then you cannot choose but yield up your self and all you have to his wise goodness, desiring that every thing may be as he, not as you will. For doth not he that trusts in another, whether in his word, or his Vertue, leave any thing with him and deposite it in his hands ? Doth he not rest assured that it will be safe ; that he will dispose of it as shall be most fitting; or that he will improve it for his benefit ? Do we not see that he ceaseth to trouble himself any further, when he hath once secured his goods in this mans keeping ? that he casts away all care, that he his not possessed with fears, but saith as we must do of God, I know whom I have trusted ? you do vainly then pretend to trust in the Father of Mercies; and as vainly hope for any contentment, if you do not thus resign up your selves and all your concernments unto him, being fully satisfied that he will do what is most conducing to your good. This is the confidence that he expects we will repose in him if we take him for our friend. And whatsoever men of fancy may perswade themselves, this is a nobler degree of trust in God then to have the particular confidence ( which they so eagerly aspire unto ) that he will do this or that. This in truth puts the most honour upon him, when we relinquish our own particular desires and refer all to his will. This is the most certain mark of our believing him to be what he is, when we dare thus leave our selves intirely to him, that he may do as he pleases with us. The times are now very sickly ; we are all in great danger ; and know not to what remedies we should fly. Death hath fetcht away so many round about us, that we may fear he will come for us next. If we will now act the part of good Christians, or if we will have any constant comfort, we must all say as David doth, What time I am afraid, I will trust in thee. Let us now refer all to God, who knows best what use he hath for his Creatures ; and where it is most fit to bestow them, either in this world or in the other. Let us be confident he will dispose us there where it is most necessary and best for us to be. And in this confidence we shall find abundant satisfaction, both in this and all other things that trouble us. It will keep us in perfect peace, thus to stay our minds on him. Nay, I think fit to add, that if there be any way to have that which we are naturally inclined to with ( be it health, or plenty or any thing else ) this is it. For doth not a person that is perfectly and without any conditions intrusted by us, think himself more ingaged and concerned to dispose of what we leave with him not only to our advantage, but as near as may be to our hearts desire ? Do not think then that God is so unkind, that he loves to cross us in that which we are inclined to ask, after we have submitted it wholly to him. Believe that he will deal very tenderly with those who have such an high esteem of him, that they ask nothing but that he will do as seems good in his eyes. He hath a greater care of these mens good then any others. He is more ingaged to them ( if we may speak in our common phrase ) and they shall see he will deal very well with them. He is much pleased that they leave all to his wisdome, and therefore will not fall to let them fare the better for not interposing their own particular desires. But if we will be taking upon us to prescribe to him what course he shall take ; if we behave our selves as if we should be undone unless things go in that one way which we determine, and therefore are alwaies sollicitously intreating him for this and that which we fancy nearly concerns our worldly estate ; then we disoblige him very much. It is a sign we would take things out of his management if we could ; and be glad to have the ordering of affairs in our own power. It shews that we are loath to trust him, and that we suspect his wisdome and goodness ; or at least that we have no such feeling of them, but that we had rather rely upon our own skill and love to our selves. Now how can this choose but render our condition as unsecure as it will make it uncomfortable ? we can never have any setled peace unless we quietly commit our selves to God ; nor can we hope for any safety at all, which is furthest off from those who so little esteem his will that they prefer their own before it. Away therefore with all your cares ( if you would be happy ) and cast them upon him, for he careth for you. 1 Pet. 5. 7. Throw them intirely upon him, for it is his business to govern the world and not yours. Let him see you rest your selves with as composed a spirit on his Providence, as if it was in your own hands to do what you list. This is the onely way to please him, and you will never sure be pleased your selves unless you think that be is so too. IV. And now having thus cast your care upon him, it must be your care to walk uprightly before him ; for from such persons ( you heard ) he will withhold no good thing. It is no part of your work indeed to busie your thoughts about future events ; but there is something else that lies upon you, which is to do what God at present bids you, that so you may be alwaies qualified for his favours. This is not only a necessary concomitant of our trusting in God, but a part of it. We must commit our souls ( or lives ) to him in well doing, as into the hands of a faithfull Creator, 1 Pet. 4. 19. We must trust in the Lord and do good ; so shall we dwell in the land, and verily we shall be fed, Psal. 37. 3. Great heed must be taken that you leave not out this Ingredient ( as I may call it ) of doing good, when you are forming your trust in God ; for the Remedy will be quite spoyled if this be wanting. For have you not seen that to trust in God is to take his word, to believe that he saith true whatsoever it be that he speaks ? Now how solemnly hath he told you that his face is against them that do evil, to cut off the remembrance of them from the earth ? that the way of the ungodly shall be turned upside down ? that the wicked shall fall into mischief ? And therefore must you not be perswaded that there is no way to be happy in this world or in the other, but by following of his counsels and obeying his commands ? If you trust God, you must necessarily govern your selves by this belief. If you give any credit to him, you must observe those rules whereby he would have you to live. And you must resolve that he hath no confidence in God, who hopes for his blessing in those waies which he hath said shall not prosper. No, he confides in his own bold fancy and presumptuous thoughts. He contradicts God, and gives him the lie. He saith in effect that he will not trust his word, which hath expressly told us, that he who walks uprightly shall be saved; but be that is perverse in his waies shall fall at once, Prov. 28. 18. You must live soberly, righteously and godly in the world, if you will have any comfort. You must walk with God if you will be under his shadow. When you run away from him, you flee from your shield, and lose your confidence of his protection. In evil waies you are insecure, and there the Angel of death is most like to meet you. But let all those that put their trust in God rejoyce, let them ever shout for joy. For thou Lord wilt bless the righteous, with favour wilt thou compass him as with a shield, Psal. 5. 11, 12. Where the righteous ( you may observe ) and they that put their trust in God are the very same men, and the only persons that can rejoyce and expect that he will defend them from all that will prove hurtfull to them. Thus I have briefly shown you of what this Ancient and Divine Remedy doth consist. All that remains is to reflect and consider if there be nor both great cause thus to trust in God ; and also such great comfort in so doing, that a man may shout for joy, as you heard the Psalmist just now express it. A Consolatory Discourse. Grounds of our confidence. As for the Cause ; there are so many grounds of our confidence as there are Perfections in God. His Goodness is so great, that he delights in our happiness. His Wisdom is so great, that he cannot mistake nor make any choice of that for us which is pernicious. His Power is so great, that as nothing can come to pass without his leave, so nothing can be hindered which his Wisdom and Goodness will have done. He is Faithfull and just also, and cannot but make good his Word. And besides he is so immutable, that he alwaies governs the World by the same eternal Rules, and gives us thereby the same hopes in him that good men have ever had. Why do we not rejoyce in God then as well as they ? What comfort would you have that is not here to be found ? Are good hopes in the Immortal, only Wise God, nothing worth ? Or can they give but a feeble support to those that are owners of them ? If they can do any thing, you see plainly there is great cause for them, and greater then for many other things. They are secured so many waies, that it is manifest God would not have us want the comfort of them. The Power of God ( for example sake ) may make you fear him, and there is great reason for it ; but it will not produce love to him. On the other side, the Goodness of God will make you love him ; but it doth not so easily produce fear. These affections grow ( as it were ) on single roots ; and that which bears the one doth not bear the other. But as for Trust in God, that grows upon them both. The Power of God will make us confide him as well as his Goodness. And besides ; the Wisdom, the Justice, the Faithfulness, and the Eternity of God, give strength and force unto our confidence. All these are apt to beget in us assurance of good from him ; so that if that be of any moment to our support and consolation, we cannot well be without them. And verily it is of exceeding great consequence. The comfort that it gives is infinite and cannot be limited. It extends it self to all things, to every case and condition of life. There is no evil which threatens us in this world, but it can help and arm us against the assaults of it. It cuts off all the matter of our trouble. We need not fear any thing. We need not be carefull for any thing. We need not torment our selves with restless desires. And there is no cause that we should be wounded with any grief and sorrow. We have nothing left us to do but only to rejoyce alwaies, because we are in his hands who exerciseth loving kindness, judgement and righteousness in the earth ; and protests that in these things he delights, Jer. 9. 24. In this we may glory and make our boast. This may justly fill us with joy and gladness, which are the only passions that this Trust leaves in possession of the heart. We may say continually let the Lord be magnified, which hath pleasure in the prosperity of his servants. There is nothing can fall out in which we may not rest exceedingly satisfied. We may welcome any thing with a pleasant countenance, because it is the appointment of our loving Father, to whose care we have left the ordering of all that belongs to us. It is impossible any thing should come to us, unless the goodness of God be first consulted. No Plague ( for instance ) can smite us, but Almighty Power must first give way. There cannot the least thing which we call evil so much as touch us, but infinite Wisdom must consent unto it. And who would be troubled if these shall bid poverty, or sickness, or the loss of friends, or death it self go to him ? Where is his wit that would bid them stay away, when God commands them to come ? Will any man that is advised take it ill, that that is done which the infinite Wisdom and Goodness appoints ? Will he desire any thing should be other waies then as that shall direct ? What contentment could a man take in a place, if it were possible to stay in it, against the will and pleasure of heaven ? Or to what purpose is it to wish to remain any longer here, when the Sovereign of the World would remove us to another and a better Country ? No, we should say chearfully, The will of the Lord be done. It is the Lord, let him do as seems good in his sight. Now Lord, will thy servants depart in peace : We will come, now that thou callest us. Thou art good and thou dost good ; and therefore we will readily follow thee, though thou leadest us to the grave. 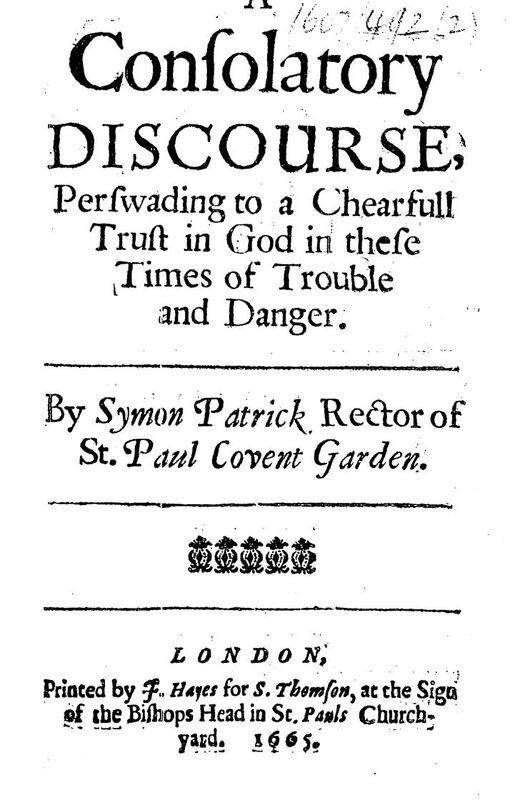 I know indeed that there are many who would be glad if I could say something else unto them : And who would rejoyce more, then I doubt they will do in this discourse, if I could give them ground to believe that they shall certainly be preserved, by confidence in God, from the infection that is abroad. This is the thing which they look for. They are much in love with life, and so they would think themselves happy if they could be assured they shall not lose it. They would fain have us to put this confidence into their minds, by putting it into the nature of Trust in God. It is worth little they imagine, if this perswasion be not intermixed with it. And if the 91 Psalm be not thus expounded, they can take but small comfort in the reading of it. But as I am loath to deceive any body, so I would not willingly have men deceive themselves, by misunderstanding that and other places of Holy Writ. I would not have them be more Bold then truly confident, the effect of which will be this, that they must needs be extreamly troubled and confounded when they find themselves confuted by Death. Some indeed of these Bold Believers may escape, and so they would without this confidence; but others of them may dye, and then consider what an amazement it will be to meet with a disappointment. For, I beseech you, have not all ages taught us that good men dye as well as others by pestilential breaths ? not so many indeed as of the rest, because there are not so many of them to die. They are but thinly scattered in the world, and therefore at no time can there as many fall of them as of the bad. But yet I say, do not some of them feel this stroke of God ? Will we condemn all those for wicked, or such as had no trust in God, who have perisht in this great mortality ? It is no good sign that you shall be safe, if you be so uncharitable. And yet one of these two you must say, either that you cannot have this absolute confidence of being preserved ; or that all those wanted this faith in God whose lives are not preserved. If you will not condemn them, then you must condemn these arrogant pretences and high confidences which limit God to mens own desires. But what then shall we say to the Psalmists words ? Do not they tell us that a man that trusts in God shall see ten thousand fall about him and he escape, Psal 91. 7. I answer, they do not promise us infallibly that we shall be secure when others die ; but only incourage us to trust in God upon the experiment which he hath made of the succesfulness of this course. This will be better understood if the occasion of this Psalm be marked. Many of the Hebrews indeed think it was penned by Moses as the foregoing Psalm was, upon the occasion of the Plagues in the Wilderness ; but it is more probable that it was written by David, when the Angel of the Lord slew 70000 in a short space ; and coming to Jerusalem was diverted from his execution by the repentance and supplications of him and of the Elders ( 1 Chron. 21. 16. ) who fled to God for refuge. Now upon this remarkable success of their obedient faith in God, which kept Jerusalem from the stroke, when a thousand fell on one side and ten thousand on the other ; David proclaims this to all succeeding times as the only remedy against infection, to take sanctuary in God, nothing doubting of his protection, if there be the same reason for it that then there was. Or rather we shall find ( upon a strict examination of his words ) that this Psalm is an incitement to his own soul to depend on God only in time to come upon the like occasions. For thus I conceive they are to be expounded. I will say of the Lord ( i.e. to himself ) he is my refuge, my fortress, my God, in him I will trust. He shall deliver thee ( speaking still to his own soul ) from the snare of the fouler, and from the noisome pestilence. i.e. from all unseen dangers that are most unavoidable. And then ( after many such like expressions ) as if he had heard the charge that God gave the Angels of him that no hurt should come to him, he concludes in a pious rapture, ( v. 14, 15, 16. ) with the words of God to them, Because he hath set his love upon me, therefore will I deliver him : I will set him on high because he hath known my name, &c. with long life will I satisfie him, and shew him my salvation. But all this is to be understood as spoken in the heat of a divine inspiration, by which God gave him a particular assurance that he would preserve him ( being of so great use to his people, and also a tipe of the Messiah ) from all the dangers that evil men or evil Angels might design to bring him into. As for our selves we have no such inspiration ( nor are these words spoken to us all ) and therefore can have no such assurance, but must content our selves with the knowledge of these three things. 1. That there is no remedy in the whole world so powerfull as this for our preservation, if it will consist with the wisdome of Gods government to grant it. And ( 2. ) that such a remarkable repentance as that of David and all the Elders or Nobles, would be very likely to obtain such a favour as the removal of Gods heavy stroke. And ( 3. ) that trust in God hath a natural efficacy in it for the preservation of particular persons, and will most ordinarily protect them. For ( as you have heard ) it expels fear, it rejoyces the heart, and it calms all the passions ; then which Physitians know nothing more necessary and effectual for mens safety in these times of Contagion. We may well then conclude that this Antidote will do great wonders by the blessing of God, who we see succeeds other means that are of an inferiour nature. And therefore let us put our selves into the hands of God, and be assured, that if we be not saved from the destroying Angel, there was great reason that we should die ; which it was not fit for any indulgence of heaven to overrule. Let us think this comfort enough, that we have committed our selves to him, who will do nothing, but what we would do if we saw so much as he. And indeed I do not see what greater comfort an assurance of deliverance would give us, then we may have in an humble submission of all to Gods will and pleasure. We should have no priviledge above others, but only to know something beforehand which they do not ; for as to the thing it self, they may have it ( though they do not foresee it ) as well as we. Now what great comfort is there meerly in knowing that we shall live some years longer in this World ? Are such men assured also that no other evil shall befall them ? Shall they never lose their health, nor their friends ? Why are they not confident of this too ? and that they shall die of nothing but old Age ; because it is said there ; No evil shall befall thee; and with long life will I satisfie him, v. 10. 16. Or if they had assurance of all this, where is the advantage they have of other men who pretend to no such confidence ? Is it such an happiness meerly to live ? Is not this a greater, to know that we shall have what God sees good ? To be assured we shall stay here as long as he judges it will make for our happiness ? And if this be the comfort, then we are possessed of it without their particular assurances. We know that a sparrow falls not to the ground without our Fathers providence. We are certain that if he see it best we shall remain here longer, before we be removed to another place. And indeed that is the thing which men of higher confidences then others should be first assured of ; that such things shall make for their greatest good, or else they can with no comfort expect them, about which, since I observe they are so little thoughtfull, their confidence methinks is of no value, but only speaks a natural desire of life to be very prevalent in them. Nay, their ardent desires of arriving at this particular assurance of a longer life, betrays too little faith of better things. If they were perswaded those things are true which they read of in another world ; what need they be so sollicitous, or esteem it such a favour to have assurance of living in this ; It argues too much infidelity, that men are so infinitely fearfull to leave their present enjoyments which makes them bend their thoughts rather to perswade themselves they shall continue here, then to be prepared for a departure to their heavenly Country. And it is a mark also of a very low spirit, to take more contentment in being assured of a longer life, then in looking upon their lives as in the hands of a good God. For this is to rejoyce in what God gives, more then in himself ; and to be pleased in one worldly blessing, more then in the vast treasures of his Providence. In those then let us think our selves to be rich and happy enough. Let us live as if we had great possessions in his love and good will to us ; Let us take our selves to be so amply indowed there, that we desire nothing more. And for an argument that you really think you have enough, let those that are able impart of their worldly goods to them that are in need. This will both be an argument that you trust in the living God, and not in uncertain riches ; and also a great means to secure you in this infectious season. For God hath great use of such men in the world ; and they are most lively to be preserved for the good of the Poor who want such Benefactors. And I heartily wish that all they who are now fled, had left a large portion of their charity behind them, for I verily believe it would have been a more effectual means to preserve them, then the change of place, or any other that they can use. But they are out of the reach of this Paper ; and it will now hold no more but only these words of David, Psal. 62. 8. Trust in him at all times ye people ; pour out your heart before him. God is a refuge for us. Primary: ed. of 1665 (London). Line breaks added for easier readability. The cure for our troubles: 1. promise of God.